Capacity: 50,000 (1967); 44,790 (1973); 47,634 (1974); 47,491 (1976); 48,460 (1977); 51,362 (1979); 48,443 (1980); 51,362 (1981); 51,319 (1983); 58,671 (1984); 58,433 (1986); 59,022 (1990); 59,254 (1991); 59,700 (1992); 67,544 (1997, baseball). Viewpoint Tickets - Best prices on Padres tickets, MLB tickets and MLB All Star tickets. Location: Left field (N by NE), 9449 Friars Road; third base (W by NW), Stadium Way and a quarry; first base (S by SW), San Diego River, Camino del Rio North, and Interstate 8; right field (E by SE), Interstate 15. Dimensions: Left field: 330 (1969), 327 (1982); power alleys: 375 (1969), 370 (1982); center field: 420 (1969), 410 (1973), 420 (1978), 405 (1982); right field: 330 (1969), 327 (1982), 330 (1996); backstop: 80 (1969), 75 (1982). Fences: Left field: 17.5 (concrete, 1969), 9 (line painted on concrete, 1973), 18 (concrete, 1974), 8.5 (canvas, 1982); center field: 17.5 (concrete, 1969), 10 (wood, 1973), 18 (concrete, 1978), 8.5 (canvas, 1982); right field: 17.5 (concrete, 1969), 9 (line painted on concrete, 1973), 18 (concrete, 1974), 8.5 (canvas, 1982); center field: 17.5 (concrete, 1969), 10 (wood, 1973), 18 (concrete, 1978), 8.5 (canvas, 1982), one section in right-center 9 (canvas, 1982), 17.5 (concrete with scoreboard in front, 1996). In the mid-1960's, San Diego Union sports editor Jack Murphy began campaigning for a new, first-class stadium that would house the NFL Chargers and a baseball expansion team. In 1965, a referendum to raise $27.75 million to build the stadium was supported by 72 percent of the voters in San Diego. The city built the multi-purpose stadium on a 166-acre site in Mission Valley. Three years later, Major League Baseball awarded a team to San Diego. For many years, Jack Murphy Stadium was one of the most difficult home run parks in baseball. However, in 1982 the Padres moved the fences forward, making it one of the most hitter-friendly ballparks in the National League. 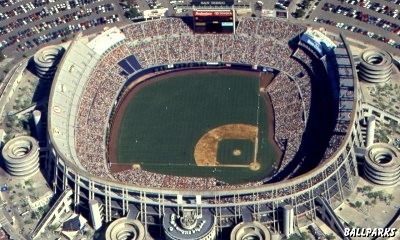 Known as San Diego Stadium until it was renamed in 1980 for Jack Murphy. Renamed again in 1997 to "Qualcomm Stadium" in return for $18 million to complete an expansion project. A.K.A. "Qualcomm Stadium, Jack Murphy Field" and the "Q." Hosted the 1992 and 1978 All-Star games. Foul poles stood 2 feet behind the fence and 1 foot in front of the wall. The right-center scoreboard which stood directly behind the right-center seats was so hot that fans there felt the heat on their backs. The only park where a foul ball could be caught out of sight of all umpires and most players, in either bullpen near the foul poles. After the 1981 season the plate was moved 5 feet back toward the backstop. Expanded during the 1983 football season by adding seats in right and right-center. Fully enclosed during the 1997 baseball season. Ivy was put on center-field fence in 1980, but removed later. Site of Willie Mays� 600th homer, on September 22, 1969, off Mike Corkins. Lou Brock became the majors� all-time stolen base leader here on August 29, 1977. Orel Hershiser broke Don Drysdale�s record for most consecutive shutout innings (58) here on September 28, 1988. Pittsburgh�s Dock Ellis pitched the first no-hitter here on June 12, 1970. Florida's A.J. Burnett pitched the second no-hitter here, which included nine walks, on May 12, 2001. 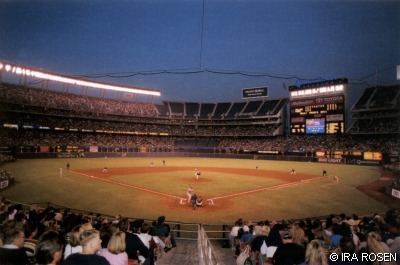 View inside Qualcomm Stadium © 1999 by Ira Rosen. Aerial view of Qualcomm Stadium courtesy of the San Diego Padres. View inside Qualcomm Stadium by Munsey & Suppes. View of Qualcomm Stadium and the surrounding area courtesy of the San Diego Padres. Tickets to NCAA Basketball Tournament, College Football Bowl, NCAA Football, San Diego Chargers, Paul McCartney, San Diego Padres and Wicked San Diego provided by Ticket Triangle.